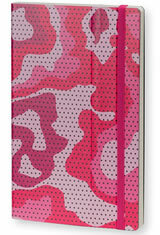 Each Stifflexible Camouflage notebook has a colored camo design on the cover the hard exterior. Creased to provide flexibility, the cover can be bent back for easy access. Inside the notebook is filled with 192 5" x 8-1/4" pages of 80g acid free ivory paper. 144 of the pages are lined, 32 are blank and the other 16 are detachable. Also included is an elastic bookmark and an interior pocket and cardboard ruler. FAC certified like all Stifflexible notebooks to help protect forests. The Stifflexible Camouflage Medium Memo & Notebooks usually ships within 1 business day unless otherwise specified. Each Stifflexible Camouflage Medium Memo & Notebooks we sell is guaranteed to be genuine, authentic and will arrive brand new & unused!